The European White-fronted Geese that winter in Britain are from the Baltic/North Sea population which breeds in European Arctic Russia and northwest Siberia, and winters predominately in Belgium, the Netherlands and Luxembourg. Britain is on the very western edge of the population’s wintering range hence only small numbers occur in the country; though numbers can vary considerably particularly in relation to severity of winter weather. Annual estimates of the percentage of young (%) and mean brood size (young per successful pair) of European White-fronted Goose, 2004/05-2016/17; recorded at key sites in Britain. The Baltic/North Sea population of European White-fronted Goose breeds in European Arctic Russia and northwest Siberia. These birds generally leave their breeding grounds in September and early October (Stroud et al. 2002). Those wintering in Britain pass through Germany, the Netherlands and Belgium, with a few also migrating through southern Sweden. In Britain, the winter distribution is highly localised. Most regular wintering sites are in the south of England, with the key flocks occurring at the WWT Slimbridge, the Swale Estuary and sites in East Anglia. No sites in Britain support internationally important numbers of European White-fronted Geese any longer, but, since the early 2000s, nationally important numbers have occurred at around 20 sites. At sites in the western half of Britain, including WWT Slimbridge, numbers have declined in recent years and most sites have been abandoned. In East Anglia, however, numbers increased at several sites not occupied before 1980 (Hearn 2004), though since the mid 2000s numbers at most of these sites have been very variable with no clear trend (Calbrade et al. 2010). European White-fronted Geese traditionally wintered on coastal grasslands and inland floodplains in Britain, grazing on natural vegetation. After decades of habitat degradation and loss, as a result of drainage and agricultural intensification, the species now feeds on cropped habitats. Permanent grasslands are the preferred agricultural habitat, although over recent decades a shift to crops such as winter wheat and maize stubble has been observed in Belgium (Kuijken et al. 2001). Given that few birds winter in Britain nowadays, and those that do have a fragmented distribution and short period of residency, there is minimal conflict with agricultural interests. Hunting is the most significant cause of mortality for the European White-fronted Goose in the Western Palearctic (Mooij 2000) and the species remains a popular quarry for hunters throughout its wintering range. Calbrade, N.A., C.A. Holt, G.E. Austin, H.J. Mellan, R.D. Hearn, D.A. Stroud, S.R. Wotton & A.J. Musgrove. 2010. Waterbirds in the UK 2008/09: The Wetland Bird Survey. BTO/RSPB/JNCC in association with WWT. Thetford. Hearn, R.D. 2004. Greater White-fronted Goose Anser albifrons albifrons (Baltic/North Sea population) in Britain, 1960/61 – 1999/2000. Waterbird Review Series, The Wildfowl & Wetlands Trust/Joint Nature Conservation Committee, Slimbridge. Kuijken, E., W. Courtens, W. Teunissen, S. van Tieghem, C. Verscheure & P. Meire. 2001. Aantalsverloop en verspreidingsdynamiek van overwinterende ganzen in Vlaanderen. Rapport VLINA-project 2000/03. (RUG & UIA m.m.v. IN), AMINAL (Min. Vlaamse Gemeenschap). Mooij, J.H. 2000. Population dynamics and migration of White-fronted Geese (Anser albifrons) in Eurasia. In: Ebbinge, B.S., Y.L. Mazourov & P.S. Tomkovich (eds.). Heritage of the Russian Arctic: Research, Conservation and International Co-operation. Ecopros, Moscow. Stroud, D.A., A.D. Fox & A. Walsh. 2002. White-fronted Goose Anser albifrons. In: Wernham, C.V., M.P. Toms, J.H. Marchant, J.A. Clark, G.M. Siriwardena & S.R. Baillie (eds.). The Migration Atlas: Movements of the Birds of Britain and Ireland. Pp. 161-165. T. & A.D. Poyser, London. The abundance of the European White-fronted Goose population in the UK is monitored through the Wetland Bird Survey (WeBS). The results from the survey are published in an annual report (see the WeBS website for details). Age assessments of European White-fronted Geese are undertaken at a few localities in Britain, with counts carried out between October and January; a focus is made on January as assessments are being undertaken elsewhere in Europe during that month as part of the International Waterbird Census. Counters record the number of first winter birds present within a flock and individual brood sizes (i.e. how many young in each family group). The abundance of European White-fronted Geese in the UK during 2016/17 was monitored through the Wetland Bird Survey (WeBS). Results are presented on WeBS Report Online. In 2017/18, the breeding success of European White-fronted Geese in the UK was assessed for flocks wintering at WWT Slimbridge (Gloucestershire), North Warren (Suffolk) and in Lincolnshire at Gibraltar Point and Elm House Farm. Overall, of the 314 birds aged, 10.8% were young birds, this being well below the previous ten-year mean (23.8% ± 2.16SE) and the lowest recorded since 2004/05 (Figure 1). Figure 1. The percentage of young for European White-fronted Geese in the UK, 2004/05–2017/18. The sample size is given above the column, with the number of sites at which flocks were assessed given in parentheses. In February at WWT Slimbridge (the only site where age assessment data have been collected regularly), 117 birds were aged with 18 young (15.4%) present in the flock, 9.0% lower than in 2016/17 (Figure 2). Brood size counts were also carried out at the site, with 18 young counted among nine broods, giving a mean brood size of 2.0 young per successful pair, slightly lower than the previous year. Elsewhere during January, birds were aged at North Warren, where 129 birds aged of which 14 were young (11.6% young); at Elm House Farm, 53 were birds were aged but no young were present in the flock; and one young bird was recorded in a flock of 15 (6.7%) at Gibraltar Point. Figure 2. 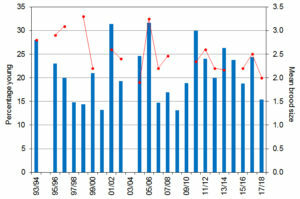 The percentage of young (blue columns) and mean brood size (red line) of European White-fronted Geese recorded at WWT Slimbridge (where data have been collected regularly), 1993/94–2017/18. 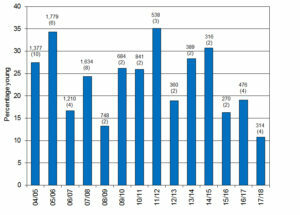 No data were collected during 1994/95 or 2003/04. Results from age assessments of European White-fronted Geese carried out at wintering locations in the UK highlight that the 2017/18 breeding season was a poor year for this species, similar to what was seen for other Arctic Russian breeding geese and swans, such as the Dark-bellied Brent Goose and Bewick’s Swan. Weather conditions at the breeding grounds during the spring and summer of 2017 were reported to have been particularly cold, which is likely to have contributed to the poor breeding season. 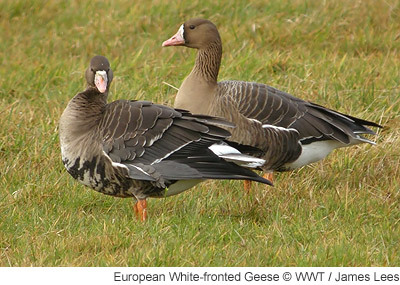 Although breeding success amongst the Whitefront flocks wintering in the UK has fluctuated in recent years, the general trend has been one of a decline. 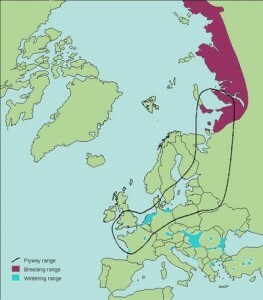 This mirrors what has been recorded for the Baltic/North Sea population of European Whitefronts as a whole, of which birds wintering in the UK are a part. This population has shown a considerable decline in reproductive output since the early 1990s (see Figure 3), and age assessments made elsewhere along the flyway, together with those from the UK, suggest little improvement in 2017. Only 7.3% of the 171,000 birds aged in The Netherlands, Belgium and the UK, were young birds, one of the lowest recorded since 1960. Although at the time of writing, some data were still being received, no further large samples are expected so this provisional result is not expected to change significantly when the dataset is completed. Across the flyway, the percentage of young was similar between Germany (7.1%) and The Netherlands (8.4%), but slightly higher in Flanders/Belgium (13.0%) and the UK (10.8%). 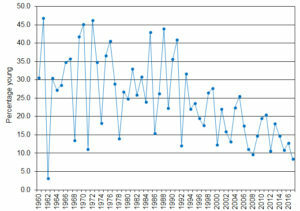 This is a typical pattern that has been observed in previous years. Figure 3.The percentage young of European White-fronted Goose population in the Netherlands, 1960–2017 (the open circles represent incomplete data). Data provided by Sovon Vogelonderzoek Nederland. Only data from the Netherlands, where a large number of Whitefronts concentrate and data have been collated for the longest period, are used to assess the long-term trend; however, the results are thought to representative of the trend for the population as a whole. Thanks go to all counters for their continued efforts in collecting age assessment data, and to Kees Koffijberg (Sovon Vogelonderzoek Nederland) for providing additional information from the rest of the flyway.